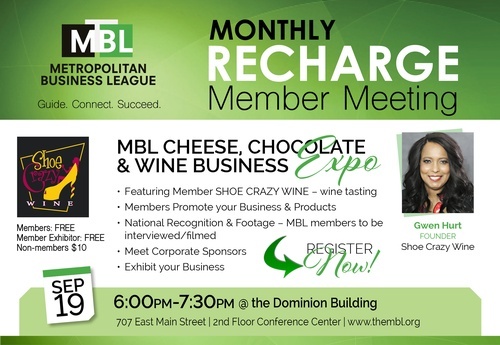 The MBL's monthly Membership Meetings are designed to initiate membership dialogue around issues of mutual concern and to provide opportunities for networking. Business leaders and decision makers are encouraged to attend the meetings to discuss specific business opportunities, potential partnerships, and relatable business topics. The corporate sponsors and partners are also given the opportunity to make presentations that share their corporate message of inclusion and economic development to those in attendance. How do you aspire to grow your business? Are you on the right path ? ​Join us to learn how to RECHARGE growth in your business !! "How To RECHARGE Growth In Your Business"
RECHARGE your attitude and approach to sales. Discuss the rapid speed of change in today's business environment with your peers. Learn practical strategies and tactics that are proven to help you sell more, and sell more easily. Patrick Carroll has been with Sandler Training since 2008 and works with business owners, sales leaders and sales pros to improve performance. He love's to sell, and train people how to sell with the appropriate attitudes, techniques and behavior plans. His favorite part of the training industry is to witness clients fight through comfort zones and bad habits to grow and prosper to reach new levels of success. Growing up in the Sandler Training network has allowed him to pursue his passion and fascination with rhetoric, communication, technology and sales psychology. Patrick has a simple mantra when it comes to sales, business and life: Help People, Have Fun, Make Money! Bring business cards for networking and raffle prizes! !